Do you know the difference between cream poodles and white ones? Or blue poodles and black ones? 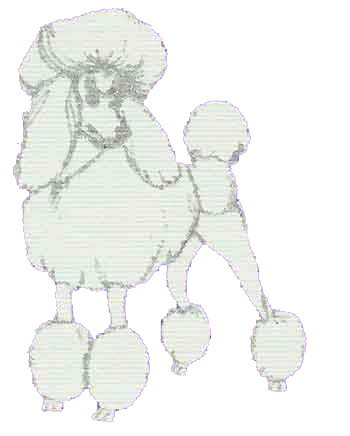 Cream poodles have a decidedly off-white color that you'll especially notice when they stand next to white poodles, or when they romp in the snow. Sometimes they can have light apricot undercoats around the ears and apricot shading on the back and hocks, although to the untrained eye they look white. "Blue" poodles are very dark gray, like a charcoal flannel suit color, or the color of a Kerry Blue Terrier. Their coats can look like a sheer black, or a midnight blue tuxedo color. Do you have photos of a blue and a black poodle side-by-side? Or a white and a cream? Send them to me (msbanta atsign earthlink dot net) and I may post them here!